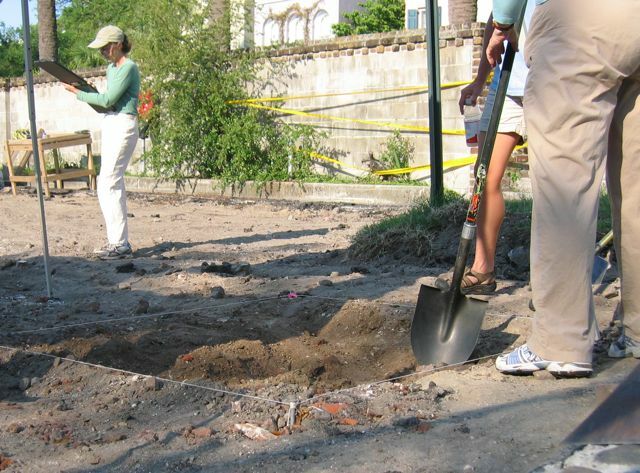 At 7:30 this hot morning, a dozen College of Charleston archaeology students began exploring the site of the colonial redan at the east end of Tradd Street in downtown Charleston. 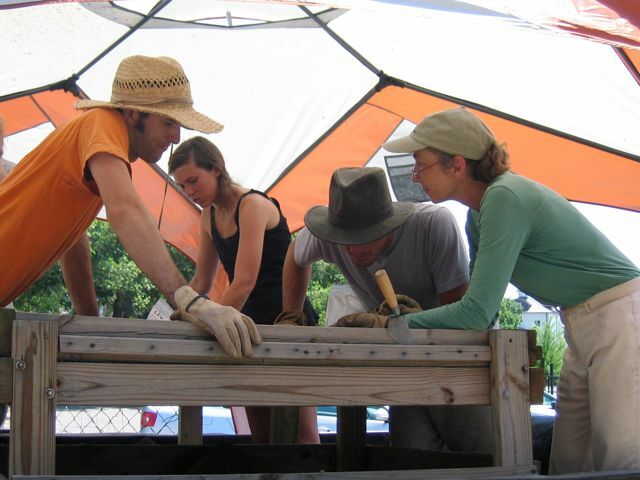 Under the tutelage of Barbara Borg, Martha Zierden, and Ron Anthony, these students will spend the next four weeks digging and sifting the soil in an effort to locate and record remnants of the old redan (ca. 1700–1785), the old Lower Market (1750–1800), and perhaps the old Exchange or Vendue House (1722–1772). 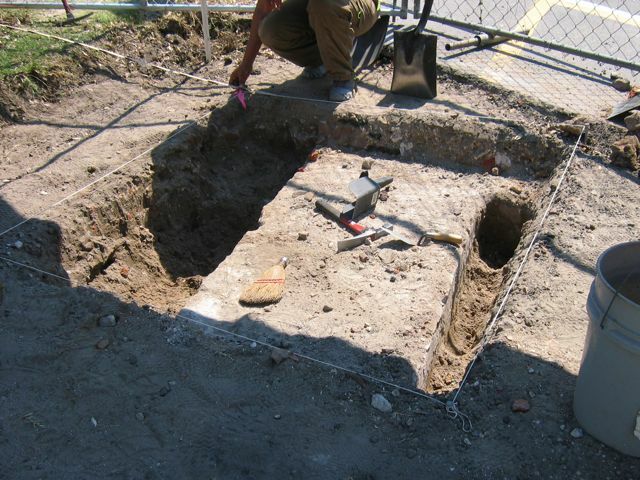 The asphalt of the city-owned parking lot was removed last Thursday, and the archaeologists established a grid for the work site on Friday. Today the students began hand digging the soil, the first two feet (approximately) of which are twentieth-century fill. Given the relatively long duration of this dig, the pace will be slower and the work more meticulous than that done in 2008. The students are digging carefully measured units, and every shovel full of dirt is being screened. 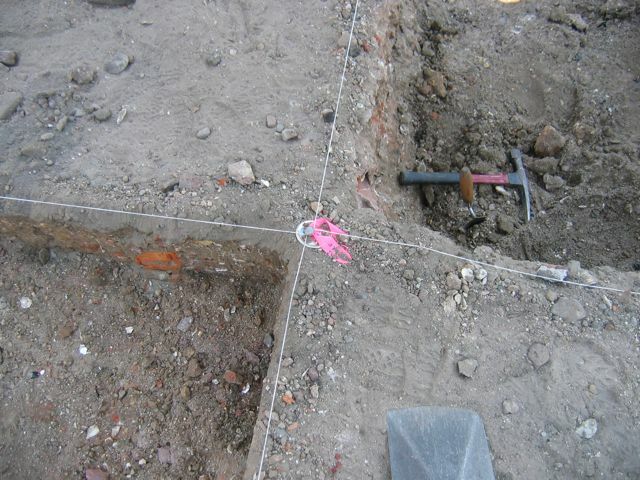 A bounty of small eighteenth-century artifacts have already been found, and at least one major architectural feature is now visible: the north wall of Vanderhorst’s North Row. 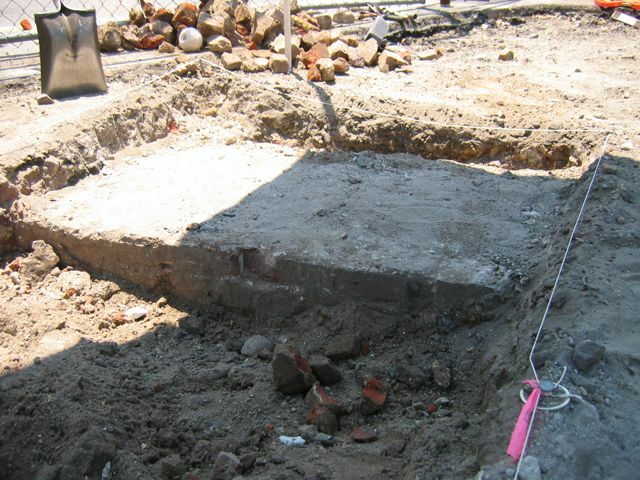 Last year’s dig in the street known as South Adger’s Wharf uncovered the northern wall of the redan or “salient angle” that stood at the east end of Tradd Street from the late 1690s to the mid-1780s. In addition, we found part of the Lower Market that stood east of the redan from the early 1750s and was extended over the redan in 1786 before being removed in 1800. After those structures were gone, the City of Charleston sold part of the land in 1804 to Arnoldus Vanderhorst, who soon afterward erected a large three-story brick tenement. That building, known as Vanderhorst’s North Row, was destroyed by the earthquake of 1886, and replaced by a large one-story warehouse that stood until the early twentieth century. As you can see in two of the photos above, we seem to have encountered part of the northern wall of Vanderhorst’s North Row, a solid mass of brick and mortar two feet wide. To what extent does this large architectural feature impact the remnants of the old redan? We’re hoping that the builders two hundred years ago worked around the massive brickwork of the redan, as they are know to have done at the Exchange Building and the Missroon House, which were built nearby with a few decades of each other. For better or for worse, I’m confident we’ll know the answer to this question within a few days. 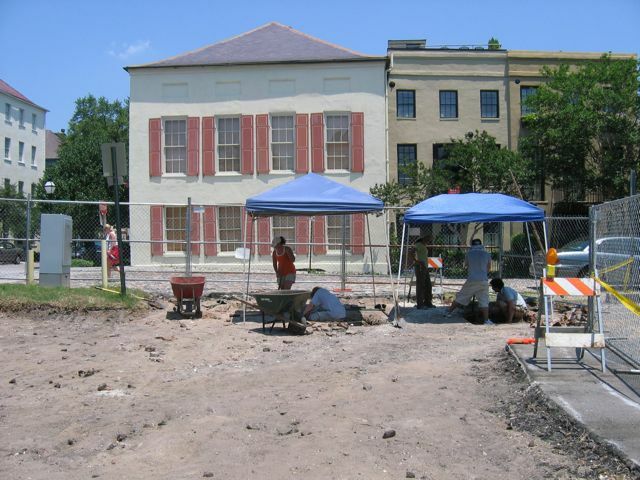 The public is welcome to visit the site and watch the progress of this dig in person between 7:30 a.m. and 2:30 p.m. It’s June in Charleston, however, so if the heat is too much for you, stay tuned to this site for continued coverage. I believe this site is where once stood a boarding house at the NE corner of East Bay and Vanderhorst Wharf with address of 56 East Bay Street. My 2nd Great-grandfather Joshua Brown & his family operated it in the early 1800’s. He was a merchant and had offices at 6 Vendue Range. I was just in Charleston last weekend and saw the brick building next to the hotel that could be on that site – does anyone know how old it is? Indigo Blue is one of the stores there. Thanks! 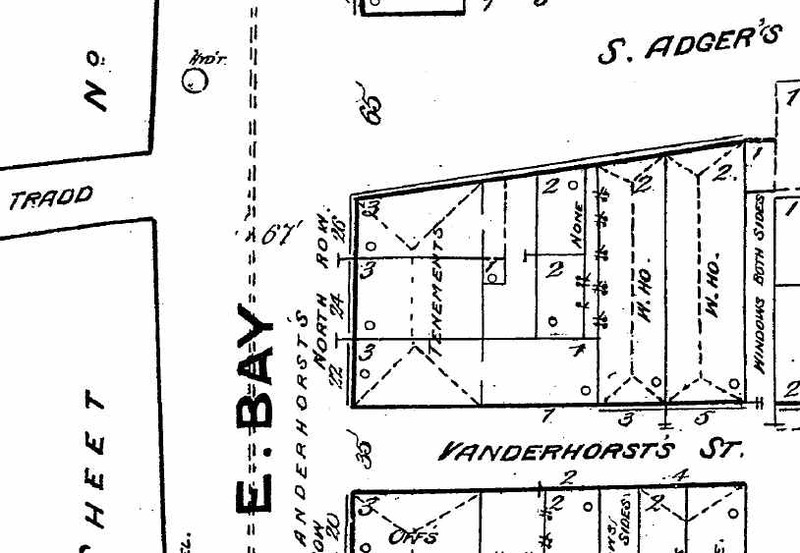 Yes, the Vanderhorst family once owned a large brick, multi-family tenement at the northeast corner of East Bay Street and Vanderhorst Wharf. And yes, the Charleston city directories of 1822 and 1825 indicate that Joshua Brown’s family resided at this address. One must exercise caution when speaking of old street address numbers in Charleston, however, since the streets have been renumbered multiple times over the past two hundred years. For more information on this topic, see my essay on this topic: http://charlestonarchive.org/2010/09/10/street-addresses/. The present buildings on Vendue Range were all built in the mid- to late 19th century–after the Civil War and after the earthquake of 1886. Thus the former offices of your ancestor are no longer standing.